Getting fat after marriage: yes, please! I’ve always heard how couples, maybe women more so than men, gain weight during their first year of marriage. According to a year of personal research I can attest that this is a fact. I was never a stick, but I find myself loading up on some extra hips and lady parts ever since I got married last summer. There are a few reasons or excuses for gaining weight after marriage and none of them have to do with being pregnant, because I’m not. According to some studies couples gain some kilos because they stop maintaining their workout routine, watch more TV and eat larger portions. I’ve definitely given up on my workout routine. Back in the States (and not married) I was Pilates and Yoga obsessed and ate smaller portions. My excuse now is that the gyms close to my house in Florence offer poor classes, but that still shouldn’t stop me from getting out and moving more. I spend almost every meal with my husband and the man can eat, let me tell you. Damn him for his svelte form and high metabolism. Nicco can eat until he’s full, but of course, somehow still has room for dessert. My metabolism died long way before I even got my freckles, we’re talking early ’80s. Luckily my Mom is a health nut, so my diet wasn’t too out of control or unhealthy growing up. Although, when I see Nicco eat fresh whipped cream and chocolate my health nut brain shuts off and this animal inside growls for some or all of it. In my case I have an extra demon to fight, Italian food! Besides being overly obsessed with great food, the food is out of this world in Florence. It’s really hard to Just Say No. 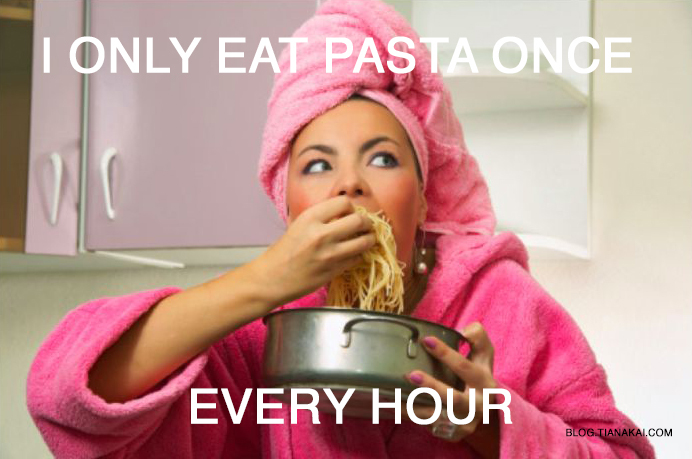 Self control, take a back seat, this woman wants some more pasta! After living in Italy for over a year I still feel like I’m on vacation, so think that it’s OK to eat large portions of pici pasta, load up on hefty cheese and drink more wine. This is not helping my young figure. I know I need to get up way earlier to have enough time to walk or hike before I start checking emails, but it hasn’t happened yet. Even if I do go for a hike I end up eating whatever Nicco eats. I can’t blame him it’s just that my tastebuds never want to miss out! Any help gals (and guys)? Don’t forget to share that meme! Hi there Mystery M! I read your article that you tweeted me, so very true and so very funny! I was thinking about something similar to #fitaly, but no one else has admitted this weight gain yet. lol. I think it happens to many newly weds and to newly expats, so there must be more of us. I desperately need a routine again. I have no solid routine now that I live in Italy, live between two cities, and working from home. Those things affect my schedule and I need to get better at it! ‘Mystery M’… I like that! Yes, I think there are a lot of us! I got a lot of comments in this expat Facebook group I’m in, so I think there’s some interest. Just not sure how best to organize us yet. cute, and true. Keep on eating Pici – they are good for your health!! Ha, ya pici will make my bones strong, or at least that’s what I keep telling myself!